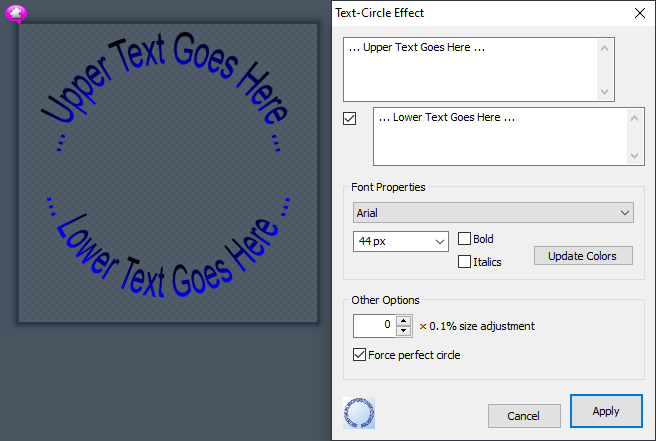 "Text Circle" is a Chasys Draw IES image effects plug-in that allows you to draw re-editable circular text in Chasys Draw IES. How do I use Text-Circle? To use Text Circle, go to the Effects menu and select External Plug-ins. You'll be presented with a dialog box where you can choose the effects plug-in you want to use. Select "Text Circle" and then click "CONNECT". The plug-in will then render the circular text on the current layer and present you with a dialog box where you can enter text and set various options. In general, you have two options for rendering text; either as one long line that spans the entire circumference of the circle, or as two lines spanning one half of the circle each. You also have options for the font, font size and font properties. Text Circle sets up APPL metadata, so you can always re-edit your circular text by just double-clicking the layer with the Hand tool.